The bears don’t always see eye to eye on business policy. Masha assumes its because her partner still has some communist brainwashing to work through. For this comic, I knew all the hay would create problems. 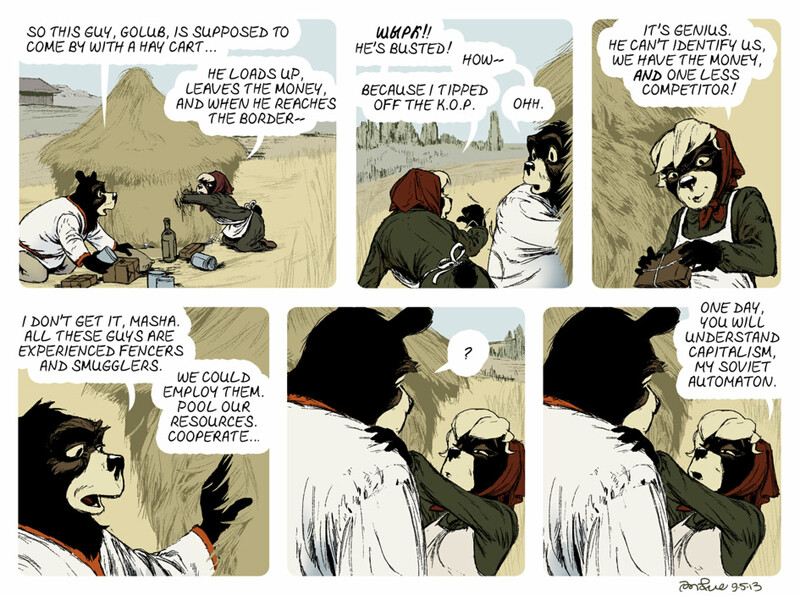 I wanted the hay to have the right texture, which meant visually, the comic could get very busy. Color holds are basically when the line-art itself is colored. I guess since my line-art is not an aliased, black-and-white TIFF file, strictly speaking, I’m missing the point of a color hold. Typically, a colorist receives a black-and-white TIFF and works from there. But I’m just doing all the steps in one Photoshop file. But the basic concept is the same: I lock the transparent pixels on the line-art layer, and use the paint bucket or pencil tool to fill the (mostly) black pixels with a color. In this comic, that all worked out pretty well. Except for two things. First, I was a bit sloppy when I deleted the white pixels on the line-art layer. The reason there are masses of shadow, as opposed to further texture, on the haystack, is because there were still some white pixels in there. But, I ended up liking the overall effect. If I do it again, I’ll do it more carefully, though. Secondly, I chose a darker color for the linework representing objects that were further away. This doesn’t quite make sense. The trees and barn should be lower-contrast than the overgrown grass in the foreground. I love Masha’s facial expression in panel 5!